Sometimes I make these fresh rolls, or cold rolls, to go with dinner. 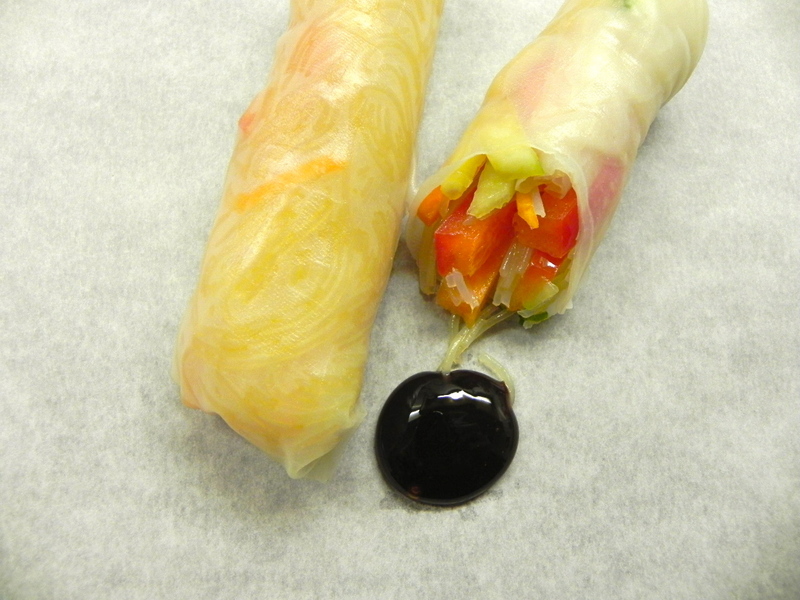 There’s nothing to it, except that rolling them can be like working with sticky plastic wrap if you soak the rice paper too long. Crisp veggies, bean-thread noodles, ginger, sesame oil. Sometimes peanuts. Fresh herbs if I have them. You see, they’re very simple. But a nice addition to the table when we’re having a stir-fry. And we often have them alongside a noodle soup dinner, with some salted edamame and small dishes of soup add-ins, like spring onion, shrimp, and chopped nuts. In fact, I kind of feel like eating them now. There really is no ‘recipe’… I just put together what I like and what I have that day. A little of each ingredient goes a long way, so I’d try this: cut into skinny strips: 1 carrot, 1/2 each x2 different coloured sweet peppers, a 2 inch chunk of cucumber; slice 2 green onions. Put those all in a mixing bowl and grate in a garlic clove & a 1-2 inch piece of ginger. Add a little sesame oil to lightly dress the veggies. Add chopped fresh parsley or cilantro and put a small pile of the mix in the centre of a softened rice paper: add cold noodles if you have them and wrap burrito style. Serve with dipping sauce. I hope this helps; let me know if you need more. what is the recipe for the dipping sauce? I just use a jarred sauce like peanut satay or whatever dipping sauce like good- some people like plum sauce.